Illus. in full color. A collection of tongue twisters that is "an amusing exercise for beginning readers."--Kirkus. child's view to reveal the flaws in society. His first picture book, And to Think That I Saw It on Mulberry Street (1937), describes a child's adding more and more imaginative elements to the story that he plans to tell about what he saw on the way home, only to end with the child actually telling the truth: he saw only a very uninteresting horse and cart. The Cat in the Hat (1957), written as a beginning reader, portrays two children having a magical afternoon with a strange cat while their mother is away, complete with a frantic cleanup before their mother can find out what they have done. This is probably his most famous work. Geisel's later books took on social questions more directly. The Butter-Battle Book (1984) condemned the cold war, and it is often removed from children's sections of libraries for political reasons. Likewise, The Lorax (1971), which condemned the destruction of the ecology, has also been banned. Altogether, Geisel wrote and illustrated 47 books, which have sold more than 100 million copies in 18 languages. In 1984 he received a Pulitzer Prize for his contributions to children's literature. Geisel died of oral cancer on September 24, 1991, at his home in La Jolla, California. He was 87. More than a dozen of his books are still in print. His title The Bippolo Seed and Other Lost Stories made Publisher's Weekly Best Seller List for 2011. 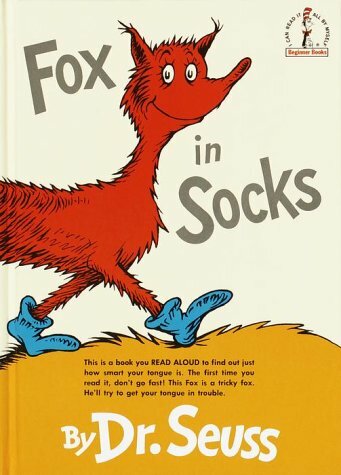 In 2012 his work The Cat in The Hat made The New York Times Best Seller List and in 2014 his title Fox in Socks: Dr. Seuss's Book of Tongue Tanglers also made the list.